Should Church Buildings be Used for Yoga Classes? So our building is used for many purposes, ranging from emotional support to physical fitness. There are weekly AA meetings, a Parkinson’s support group, and youth indoor soccer practice inside our spacious fellowship hall (aka the “gym”). A co-op preschool uses the building on weekday mornings, and individuals can also rent out the sanctuary for weddings and funeral services. The facilities manager reports that our building is used by outside groups an average of 60 hours a week. The usage fee that non-members pay helps offset energy and cleaning costs. What a gift it is to be able to serve the community in this way! Allowing non-members to use our building is a wonderful way for the church to be an inviting and inclusive presence in the community. Hebrews 13:2 reminds us, “Do not neglect to show hospitality to strangers, for by doing that some have entertained angels without knowing it.” Our job is to open the door. Yoga, in particular, is an activity that I believe complements the Christian faith. Yoga practice in a church building could benefit members and non-members alike. Yoga originated in India, so the poses have Sanskrit names which are often translated into English. While Sanskrit is the liturgical language of Hinduism, the pose names are not religious. Common poses include, in English: “downward facing dog,” “chair pose” and “child’s pose”. 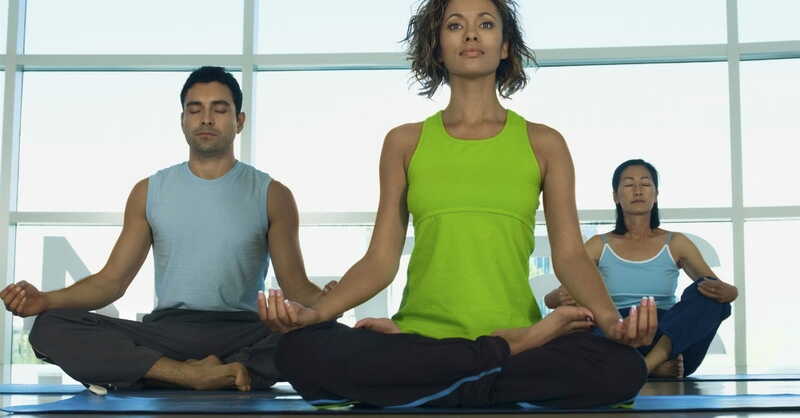 During a yoga session, spiritual awareness is melded with physical activity. Yoga involves moving through a sequence of poses, which are often paired with breath to create mind/body awareness. Yoga instructors encourage participants to stay present in the moment, and emphasize effort over achievement and competition. Participants are allowed to modify movements and take breaks as needed, encouraging self-care and grace giving. While yoga is not religious, it can help build a spiritual awareness and create feelings of balance and clarity. The final pose of every class involves lying down on the mat in a comfortable position, typically on your back. Similar to the Lord resting on the seventh day of Creation, every yoga class concludes with rest. The lights are dimmed. Participants are encouraged to give thanks for the experience just had and then simply rest in stillness. This is when I often pray. Sometimes it is a prayer of gratitude, thanking God for this body I’ve been given, so capable and adaptive. Other times I weep, forced by stillness to acknowledge my pain. I humbly ask God for support. “The Lord will fight for you; you need only to be still” (Exodus 14:14). Some people need opportunities for stillness built into a routine, and yoga can provide that structure. After the final resting pose, instructors end the class by saying “Namaste,” which translates directly to “the divine in me bows to the divine in you.” I often think of bowing as worship, but in this context it is an acknowledgment that we are all spiritual beings, each on our own path, yet also connected. Some instructors say, “The light in me honors the light inside each of you” which echoes the Christian faith even more to me, like the childhood chorus of This Little Light of Mine. As Christians, we can leave this setting renewed to continue on our faith journey. Participants from other walks of life may get just a workout, or maybe more. Something stirring in the soul … and what better setting for a spiritual awakening than inside a church building? People may come inside our building for many reasons. If we are open, welcoming, and “Christ-like,” our building will be an inviting place where people will feel comfortable and want to return. We need not fear outsiders or unfamiliar activities, “For no one can lay any foundation other than the one already laid, which is Jesus Christ.” (1 Corinthians 3:11). As Christians, we can evangelize by supporting the range of needs of God’s children in our communities. Open your doors and your hearts this year. Namaste. How can we as the Church better provide for the needs of our community? Help us look past stereotypes and learn more about the things of which we are unsure. Guide us as we discern together the best way we can support your children with all of our resources.